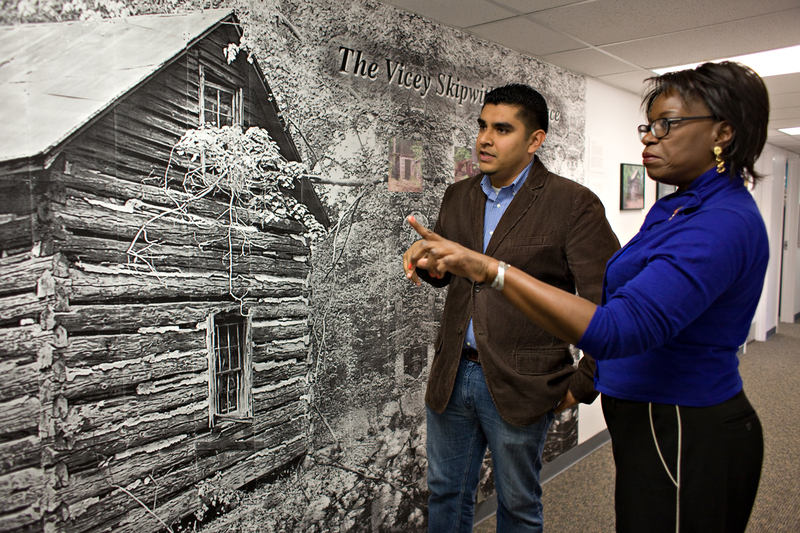 A photographic mural of a Reconstruction-era Virginia log cabin dominates the hallway leading to African and African American Studies faculty offices in the School of Social Transformation, within the College of Liberal Arts and Sciences, in Wilson Hall. From afar it reads as one seamless piece of art, beckoning visitors to step into another place and time. But a closer look reveals more than 200 small prints, meticulously pieced together to create the 15-by-7 foot scene. Reyes says the project began as a family effort to qualify the Civil War-era cabin for inclusion on the National Register of Historic Places and the Virginia Landmarks Register; both were achieved in 2007. But for Reyes the project became much more. Her interest expanded beyond her immediate family’s connection to the cabin when her research into the public archives “introduced” her to a woman named Vicey Skipwith (1856–1936), who purchased in 1888 – just 11 years after the military end of Reconstruction – this log cabin and six acres on the same land that Vicey’s parents had been enslaved. “Skipwith became a wage laborer on the Prestwould Plantation after the Civil War, with census records noting her skills as a cook,” Reyes says. “She paid $62 for her six and one-fifth acres of land. She also paid 50 cents in taxes the following year. Sixty-two dollars in 1888 is the approximate equivalent of $1,500 in today's economy – still a substantial amount of money. Reyes, who had grown up living in California, Honduras and New York City, but spent many summers on her grandmother’s farm in Virginia, began engaging in “memory telling” with some of the county’s older residents, whose knowledge of post-Civil War life and stories had been passed down from their own parents and grandparents. She scoured public records, U.S. Census databases, and Mecklenburg County Slave Schedules. “When I was not in Virginia doing field work, I immersed myself in reading about women and slavery, Virginia history, vernacular architecture, navigable waterways, material culture, and the Civil War,” Reyes says. “And every time I went back, I introduced myself to new people, especially the elderly. They were also ‘libraries.’ As an African proverb tells us, when the elders die, libraries are gone. And so, I often went to the elders – black and white – in order to hear them talk through memory-telling. Combining these resources with greater truths emanating from knowledge of gender roles, emancipation, the rights of citizenship, and land ownership, Reyes says she was able “to fill in the spaces between documented history and collective memory,” crafting a story that gives rich context to the cabin and a glimpse into the inner lives and ambitions of Vicey Skipwith and her contemporaries. At ASU, Reyes teaches courses on women and gender in African and African-American Diasporas in the School of Social Transformation, and on material culture and cross-cultural studies in the Department of English, in the College of Liberal Arts and Sciences. With innovative research methodologies, her edited books and essays cover a range of topics that focus on women and public history, gender and sexuality, migrating subjects, and visualizing slavery in the Atlantic World. Her current book project focuses on symbolic watersheds and African-American oral narratives in Virginia. Reyes’s research in Mecklenburg County turned up not only an Arizona connection to this project, but a genealogical and historical relationship to Arizona State University. During the course of her research, Reyes has met two brothers, Brad Sydnor and Doug Sydnor, who are architects in Scottsdale, Arizona. Their father, the late Reginald G. Sydnor, was the architect who designed the Hiram Bradford Farmer Education Building (1960) at ASU. 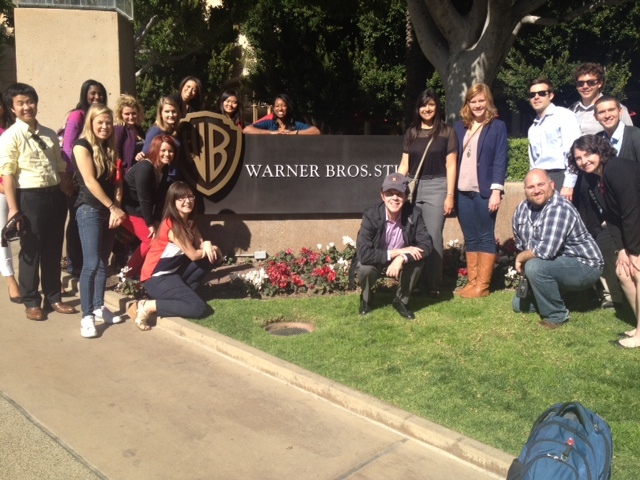 Eighteen ASU students in a business journalism reporting course spent their spring break in Los Angeles tracking the money side of entertainment.